Manage your calendar and schedule meetings with customers right from Help Scout. 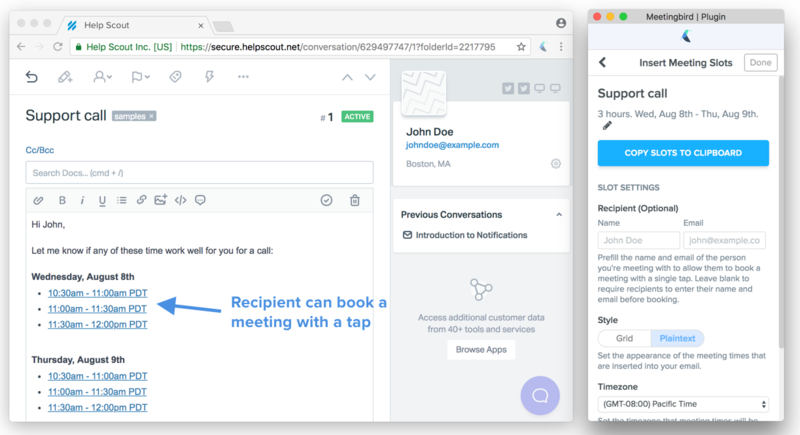 Help Scout is a popular customer service platform that helps teams of all sizes deliver great customer service. The Meetingbird integration for Help Scout makes it easy to manage your calendar and schedule meetings with customers directly from Help Scout. If you haven't already, download the Meetingbird extension for Chrome here and follow the instructions for signing in or signing up for an account. Meetingbird supports both Google Calendar and Office 365 accounts. Open Help Scout in Chrome. Click the Meetingbird icon in the Chrome toolbar to open the Meetingbird integration for Help Scout. From here, you can add events to your calendar, insert meeting times into email replies, and access scheduling links. Click the "My Calendar" button to open your calendar. Click anywhere on the calendar to begin creating a new calendar event. You'll now be prompted to copy the meeting slots and paste them into your email. Before copying, use the list of settings to customize the Style (Grid or Plaintext), Timezone, and Time Format. Paste the slots into an email reply and send your email. The recipient will be able to book a meeting by simply tapping a time slot. Scheduling Links allow you to setup preferences for specific types of meetings (Sales calls, product demos, recruiting interviews, etc.). With the Meetingbird integration for Help Scout, you can access a list of your scheduling links and quickly paste a scheduling URL into an email. Just click the "My Scheduling Links" button to do so. Let us know by emailing us at [email protected] Thanks for using Meetingbird!